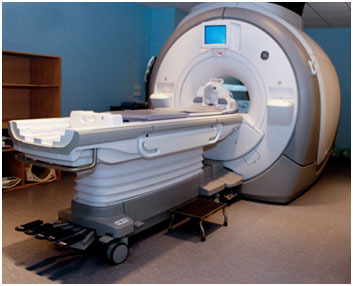 An MRI is a type of scan that creates pictures using magnetism and radio waves. MRI scans produce pictures from angles all around the body and shows up soft tissues very clearly. They take between 15 and 90 minutes. MRI can be used to look at most areas of the body. For some parts of the body and for some types of tissues, it can produce clearer results than a CT scan. You might have an injection of a special dye (contrast medium) before the scan to help make the pictures clearer. In some situations, your doctor may suggest MRI if a CT scan hasn't been able to give all the information they need. In some cancers, such as cervix or bladder cancer, MRI is better than CT at showing how deeply the tumour has grown into body tissues. It can be particularly useful for showing whether the tissue left behind after treatment is cancer or not. metal fragments anywhere in your body – for example from an injury, dental fillings and bridges. You can still have an MRI scan if you have some metals in your body, but your doctor and radiographer decide if it’s safe for you. Tell the scanner staff about any metals in your body. Some people feel claustrophobic or closed in when they’re having an MRI scan. Contact the department before your test if you’re likely to feel like this. The hospital staff can take extra care to make sure you’re comfortable and that you understand what’s going on. Your doctor can give you medicine to help you relax if you need to. Tell the department staff beforehand if you think you’re pregnant. The radiographer might ask you to change into a hospital gown. You might not have to undress if your clothing doesn’t have any metal, such as zips or clips. The scan can last between 15 to 90 minutes. It’s safe to take a relative or friend into the scanning room with you. But check with the department staff first. Your friend or relative will also need to remove any metal they have on them. Your radiographer takes you into the scanning room. The MRI machine is large and shaped like a tube. You lie on your back on a couch that can slide into the MRI machine. You might have an injection of a dye (contrast medium) into a small plastic tube (cannula) into a vein in your arm. This helps to show up your body’s organs more clearly. Some people are allergic to the dye, so your radiographer will ask about any medical conditions or allergies you have. The dye injection can make you feel sick, give you a headache, you may come over warm and have a metallic taste in your mouth. Sometimes you feel a little dizzy. These are usually mild and last for a short time. Tell the radiographer if you feel unwell at any point during or after your scan. You need to lie as still as possible. The scan is painless but it can be uncomfortable to stay still. Tell them if you're getting stiff and need to move. Once you’re in the right position on the couch, the radiographer leaves the room. They can see you on a TV screen or through a window at all times from the control room. You can talk to each other through an intercom. The couch moves through the MRI scanner. It takes pictures as you move through it. Your radiographer might ask you to hold your breath at times. The scanner makes a very loud clanging sound throughout the scan. You’ll wear earphones or headphones to protect your hearing. You can also listen to music. Keeping your eyes closed can help. This 1-minute video shows you what happens when you have an MRI scan. Voiceover: This is an MRI scanner. This type of scan uses magnetism to build up a picture of the inside of your body to help your doctor either make a diagnosis and decide what treatment you need or to find out if your treatment is working. The radiographer makes sure you are lying in the correct position on the couch and explains what will happen. You need to lie as still as possible. MRI scans are very noisy so you wear ear plugs or headphones. During the scan you won’t feel anything. The space you lie in can feel small, if you think you will find it difficult being in a small space, contact the scanning department before your appointment. The radiographer controls the scan from a separate room but they will be able see and hear you throughout. Here you can see an example of an MRI scan. Once the scan is finished you can go home. When the scan is over, your radiographer comes back into the room and lowers the couch so that you can get up. You usually stay in the department for about 15 minutes after you scan if you've had the dye. This is in case it makes you feel unwell. Your radiographer removes the cannula from the vein in your arm before you leave. You should then be able to go home or back to work and also eat and drink normally. An MRI is very safe and doesn’t use radiation. Some people can’t have an MRI but the checklist picks this up beforehand. Your doctor and radiographer make sure the benefits of having the test outweigh these risks. You might get a small bruise around the area where they put the needle in for the cannula. There's a risk that the contrast medium will leak outside the vein. This can cause swelling and pain in your arm but it’s rare. Tell your radiographer if you have any swelling or pain. Let your GP know if it doesn’t get better or starts to get worse when you’re at home. An allergic reaction to the contrast medium injection is rare. This most often starts with feeling weak, sweating and difficulty breathing. Tell your radiographer straight away if you feel unwell so they can give you medicine to control the reaction. You should get your results within 1 or 2 weeks. Waiting for results can make you anxious. Ask your doctor or nurse how long it will take to get them. Contact the doctor who arranged the test if you haven’t heard anything after a couple of weeks. You might have contact details for a specialist nurse who you can contact for information if you need to. It may help to talk to a close friend or relative about how you feel. For information and support, you can contact the Cancer Research UK nurses on freephone 0808 800 4040. The lines are open from 9am to 5pm, Monday to Friday. We have more information on tests, treatment and support if you have been diagnosed with cancer. Diffusion weighted magnetic resonance imaging in bladder cancer, is it time to replace biopsy?